or carpenter. 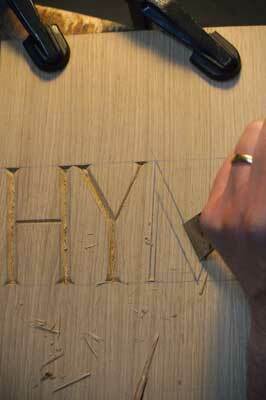 Professional carvers rarely use flat chisels, except for cutting the straight lines and serifs of letters. The flat chisel of a carver has a bevel each side of the blade so the cutting edge is in the centre, unlike a joiner's chisel, which has the bevel on one side only. There is always a practical reason for our actions; in this case it is essential when executing an inscription for your head to be static above the letter you are cutting. This enables you to correctly observe the angle of the cut created by the chisel, usually at 60° to the surface, though this differs according to the applied decoration of the inscription. Constantly turning a chisel around to present the flat side - as with a joiner's chisel - encourages your head to move. Using the carver's double-bevelled chisel ensures you don't have to keep turning the tool around, therefore it is more efficient and helps your head to remain central above the letter. This helps explain why you will never find a traditionally trained carver using a joiner's single-bevelled flat chisel. It's essential for a commercial woodcarver to be ambidextrous, as we have to navigate the orientation of the grain; turning a block of wood around or upside down is not an option. To cut letters professionally, the mallet needs to be wielded left- and right- handed. All the 'righties' find it hard to use their left hand, while the 'lefties' live in a right handed world so have an advantage, though in ancient times they were thought to be possessed! Being ambidextrous has an advantage, though not essential when stone carving, because the beds - grain - may, within reason, be ignored. But stonemasons in olden days were always encouraged to be right-handed, ensuring the wasted stone and rubbish that was removed from the stone block always fell towards the same side of the line of bankers - stone benches - allowing the labourers to access and remove it easily. Now let's have a little physical exercise and jump on a fairly high soapbox! Forcing a chisel square into the surface of wood at any time - usually with the blow of a mallet - will disturb and dislodge the grain either side of the cut. 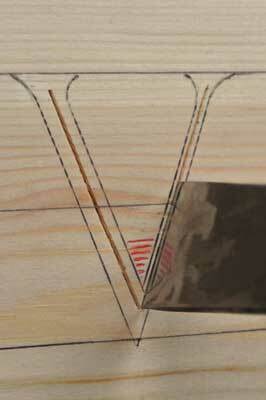 Chisels are wedge-shaped in section no matter how thin they are, with some being extremely thick and chunky. Repeating this action - especially cross-grain - perhaps to stab each side of a stem or vein in foliage work, moves and dislodges the grain twice between the cuts, creating a weakness that results in the stem breaking away from the background. 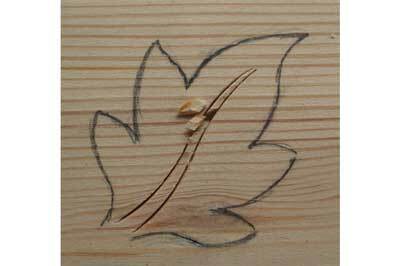 In all carvings many features have weaknesses that will be displaced and break off if you pursue this action, for example, the stabbing of each side of the points of a leaf. I would advise the 'part-time carver' not to attempt this procedure, especially when cutting fibrous, loose-grained timbers. Better to relieve the feature both sides with a fluter before stabbing; this removes the waste sensibly without disturbing the grain, leaving the carved element strong. 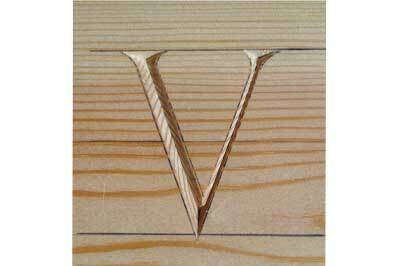 Applying the same logic, why force a deep vertical cut in the centre of an incised letter? 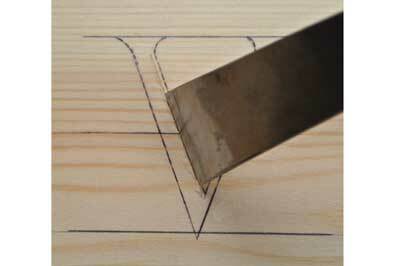 The belief is that it provides you with a guiding cut that hopefully becomes the bottom of the 'V' cut. Well, it might, but at what cost? Inscriptions that are cut along horizontal grain are particularly vulnerable- church inscriptions usually have vertical panels, so the grain is usually upright - as are those applied around a curve where the orientation of the grain constantly varies. Repeatedly stabbing vertically down where lines converge - as with the points of the letters W, M, N, A, V and Y has the consequence of developing an area of weakness that can break between these converging lines, particularly with smaller letters. If I cut larger letters - 100mm plus - I would relieve the timber between the lines with a fluter before cutting the 60° incisions. 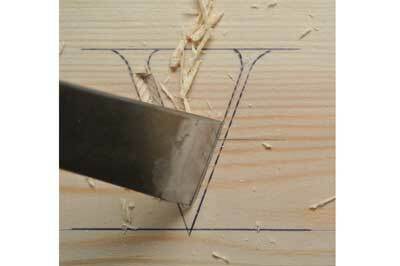 An exception to this procedure is chip carving, where the geometric shapes created very often have wider angles to the cuts -greater than 60º to the face - so forcing your cutting edge into the timber isn't so crucial. There are two rules essential to woodcarving: work with the grain as much as possible and always work away from the weakness. 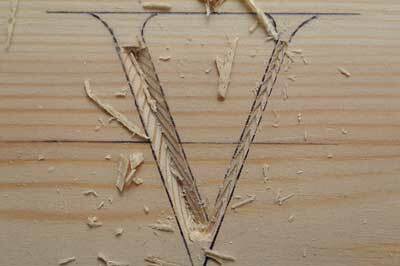 Hence, as mentioned in a previous article, you can't use a parting chisel to cut letters, as one wing always cuts against the grain. Adopting this stabbing procedure usually initiates physical exercise, kneeling on the floor trying to locate the missing piece amongst many other similar pieces that have fallen. Making errors in a large workshop with other carvers around teaches you not to draw attention to the situation by any action or sound, since the taunting and recrimination can be relentless if discovered! Obviously, this absolutely never happens to me - I'm devoid of making mistakes! It's strange; these remarks focus my thoughts on the fictional woodcarver Geppetto and his magical carving of Pinocchio. I've noticed they are often punctuated by my nose aching and increasing in size... how odd?